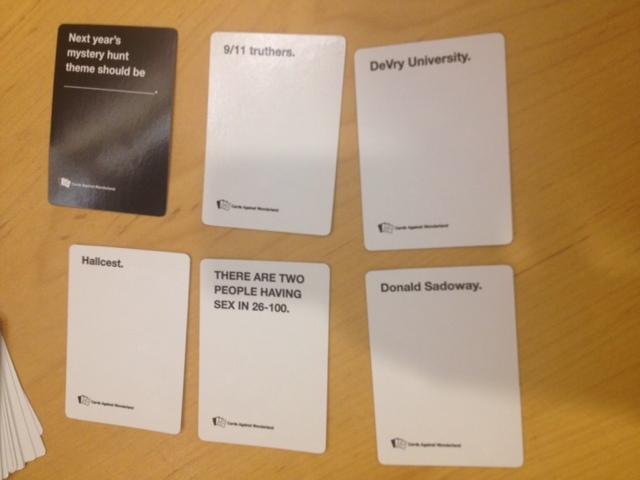 People play Cards Against Wonderland, a game in the vein of Cards Against Humanity. The King of Hearts, apologetic, slightly bubbly, and somewhat easily confused, plays host. He apologizes for all the demands his compatriots have been making, and wants to provide everyone with a fun break. The rules of the game are the same as the Cards Against Humanity rules, but played with a special customized MIT Mystery Hunt/Wonderland deck. If you'd like to play the game at home, here are the pdfs for the black cards and the white cards (Fair warning: some of these cards are definitely NSFW). Alice Shrugged would like to thank Josh Dillon (an Alice Shrugged team member) and the rest of the Cards Against Humanity creators for formatting and printing these snazzy decks for us! After a certain amount of time (45 minutes of play, with a table change halfway through, though they may stay until the end of the deck if they like), the King of Hearts gives them an answer phrase, which is "A DORMOUSE, CATERPILLAR, OR RABBIT MAY DIG GARDEN HOLES."